Off to the Pizza World Championship. From left: Sean Magnetti, Mark Spitzer, Pat Joyce, Marco Magnetti, Aisling Joyce, and Matteo Magnetti. Photo: Liam Carroll. Matteo, Marco, and Sean Magnetti of Pizza M, Joyce’s Knocknacarra, will be putting their skills to the test when they take part in the Pizza World Championships in Italy next week. Competitors from all over the world will get together to compete in the annual event, which takes place in Parma from May 8 to 10. 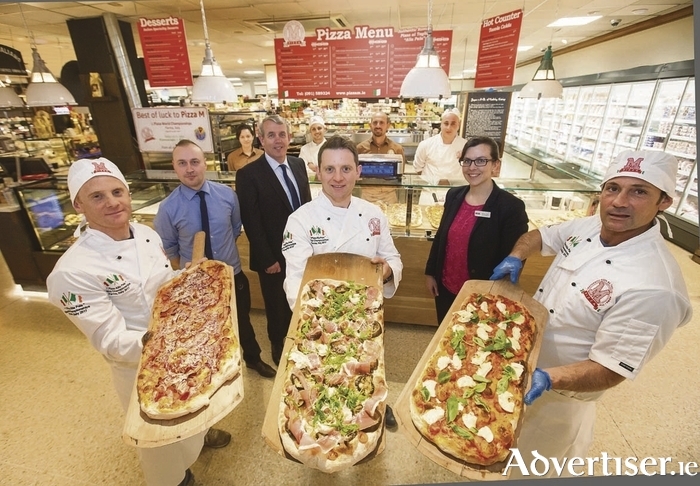 The pizza chefs are competing in the Pizza alla Pala category, a traditional long rectangular stretched style of pizza, which they produce at their pizza bar in Joyce’s Knocknacarra. They are hoping to impress the judges by putting an Irish twist on a classical pizza. Galway Bay crab, Irish goat's cheese, Burren oak smoked salmon, and wild samphire are among the ingredients in their world championship entry. Judges will scrutinise the pizza to ensure it not only looks and tastes good, but that it conforms to traditional methods. To achieve this, the dough will be proved for at least 72 hours, to ensure it has a light and crispy base which is rich in flavour. Their flour has also been specially blended by a small traditional mill situated in foothills Rome where the “alla Pala” pizza originated. Every detail has been tried and tested. Now all they need is to add a bit of Irish luck as the final ingredient to impress the judges. You can follow their progress on facebook.com/pizzam ie.